The annual convention is a members only event and membership costs just £25 per year. There is a small fee for the Convention and more details on that, and booking forms and further information, will be delivered to members in early March, and available on this page shortly after. 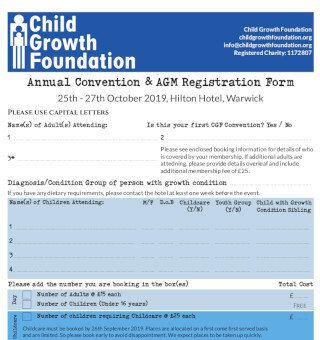 If you have yet to join the Child Growth Foundation, and would like to do so, then please go to our Join page. The Convention is a wonderful two-day event that delivers outstanding information and guidance sessions and brings together children and families in mutual support. It is incredibly well-attended and hugely enjoyed. The information and application form are downloadable below. The 2018 convention was attended by many parents, children and professionals, and throughout the day on Saturday, we had a vast array of eminent speakers, including Prof Karen Temple, Prof Deborah Mackay, Dr Emma Wakeling, Dr Assunta Albanese, Dr Lee Hudson, Dr Trevor Cole, Dr Kate Tatton Brown, Dr Megan Freeth, Dr Chloe Lane, Dr Alice Welham. We are very fortunate to have some of the best healthcare professionals, endocrinologists and geneticists in the world and they give up their valuable time to come to our annual convention. Many of the professionals spend the whole day with us and talk to parents on an individual basis, offering their expertise in a very informal and relaxed setting. They all thoroughly enjoy their day with us and quite often learn as much from our members as our members learn from them. 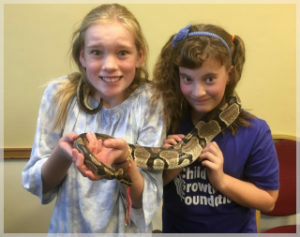 We had a record amount of children attending this year and the youth group continues to grow in popularity, with many of the young people making new friends as well as enjoying meeting up with old friends. At the end of a very hectic day, it was time to relax, have a drink and enjoy the company of others who understand what you are or have been through. There is nothing like the support of another parent, when you tell them about your struggles and they say, “that’s exactly what happened to us!” We are already planning our next convention, and as always, it will be great to see all our CGF friends again, as well as greeting new ones. 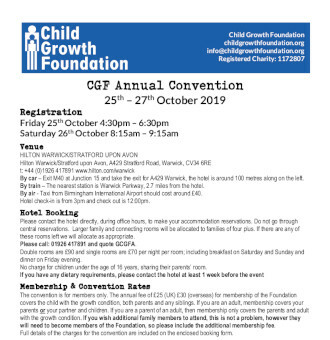 Although the convention is for members of the CGF, we welcome new members from anywhere in the world and at last year’s convention, we welcomed members overseas again. What remains clear is that patient support groups and the help and advice patients receive from these groups, as well as other parents, cannot be underestimated. The same is true of healthcare professionals, who are increasingly relying on patient support groups to help their patients, which can only be considered as great progress for us all.